Eight hundred years after St. Francis of Assisi crossed the sea to visit the sultan of Egypt, another Francis will travel by plane this weekend and become the first pope ever to visit the Arabian Peninsula. Like the first Francis, the pope is on a twofold mission. First, he is promoting peace and harmony between the followers of different religions, and in particular between Christians and Muslims. “Make me a channel of your peace” is the theme he has chosen for his visit, words taken from the prayer of St. Francis of Assisi. He is also going to encourage the one-million-strong Catholic community in the United Arab Emirates, which is entirely “a church of migrants.” As a missionary pope, he hopes that his visit will further the proclamation of the good news here. “Make me a channel of your peace” is the theme the pope has chosen for his visit, words taken from the prayer of St. Francis of Assisi. On this his 27th journey to foreign lands, Pope Francis will visit Abu Dhabi, the capital of the U.A.E., from Feb. 3 to 5 to participate in an international interfaith meeting on “Human Fraternity,” organized by Muslim leaders and at their invitation. The goal is to engage with Muslim leaders for the purposes of building peace and counteracting extremism. The pope also thanked “my friend and dear brother the grand imam of Al-Azhar, Dr. Ahmed el-Tayeb” and others involved in the preparation of the meeting “for their courage and desire to affirm that faith in God unites and does not divide.” He has met the grand imam of the Al Azhar mosque four times since 2016, when the dialogue re-opened between Al-Azhar and the Holy See. Their embrace in Cairo on April 28, 2017, went viral and offered a powerful visual message of brotherhood between Christians and Muslims. The pope’s visit coincides with the U.A.E.’s celebration of the Year of Tolerance, announced last December by Crown Prince Sheikh Zayed, who had visited him in the Vatican in September 2016 and invited him to his homeland on the Persian Gulf. The U.A.E. became an independent state in 1971, along with Qatar and Bahrain. 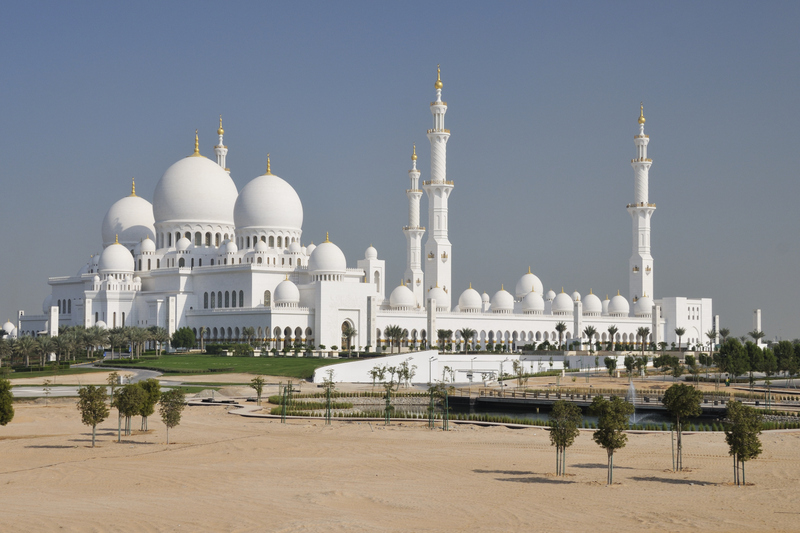 It is an absolute monarchy made up of seven emirates; Abu Dhabi is the largest of the seven and also the capital city. A majority of its 10 million residents are Muslim, but only 1.5 million are citizens; the rest are migrant workers from Egypt, Palestine and Iran, as well as Pakistan, India, Bangladesh, the Philippines and many other countries. Among them are roughly 1 million Christians, most of whom are Catholic, mainly from India and the Philippines. There are 40 churches in the U.A.E. including seven Catholic ones, as well as 20 kindergarten and primary schools and seven secondary schools run by religious orders. Relations between the U.A.E. and the Holy See began under Pope John Paul II. The two entities established diplomatic relations on May 31, 2007. It was recognized then that while Islam is the state religion, the Constitution recognizes religious liberty, and Christians can carry out religious activities publicly. While Islam is the state religion of the U.A.E., the Constitution recognizes religious liberty, and Christians can carry out religious activities publicly. The Emirates are part of the Apostolic Vicariate of Arabia that include Oman and the Yemen. The vicariates’ see is located in Abu Dhabi, and the Apostolic Vicar is the Swiss-born Bishop Paul Hinder, O.F.M. Cap. As an indication of U.A.E.’s religious tolerance, it will broadcast all the events in which the pope participates and share the videos free of charge to news outlets. Moreover, the government has given a free day on Tuesday to workers in the private sector who have tickets to attend the pope’s Mass. Pope Francis is scheduled to arrive at the Abu Dhabi international airport at 10 p.m. local time on Sunday. He will exit from the plane by a passenger boarding bridge, without touching the ground, as is the tradition for receiving distinguished guests. He will then be driven to the Al Mushrif Palace, the official state residence for such guests. At midday on Monday, he will arrive at the presidential palace, a complex of five structures with 76 domes, for the official welcome ceremony and a private conversation with the crown prince. That afternoon, Francis will go to the magnificent Great Mosque of Sheik Zayed, one of the largest in the world and the most important place of worship in the country. After visiting the tomb of Sheik Zayed bin Sultan al-Nahayan, the founder of the U.A.E., he will go to the mosque’s Courtyard Sahan for a private meeting with members of the Muslim Council of Elders, an Abu Dhabi-based international organization that promotes peace in the Islamic community. The council includes scholars and Muslim dignitaries known for promoting humanitarian values and the principles of tolerance in Islam. Pope Francis will address the Global Inter-religious Meeting on “Human Fraternity,” attended by Muslim, Christian and Jewish leaders, as well as representatives of other religions. Pope Francis is scheduled to spend 45 minutes with the council elders, after which he will depart with the grand imam and other elders for the Founder’s Memorial. This is a national monument that commemorates the life and Sheik Zayed, whose determination led to the founding of the U.A.E. on Dec. 2, 1971, following Britain’s withdrawal from the zone in 1960. There, after being welcomed by the crown prince, Pope Francis and the grand imam of Al-Azhar will address the Global Inter-religious Meeting on “Human Fraternity,” attended by some 700 distinguished guests, including Muslim, Christian and Jewish leaders, as well as representatives of other religions. This is the only formal address that Francis will give during his two-day visit. Once the conference has ended, Pope Francis and the Grand Imam will return to the Al Mushrif Palace. There he will greet the crown prince and his family, and then have dinner before retiring for the evening. A Mass at the Zayed Sports City Stadium is expected to be the largest gathering of Christian worship ever celebrated in the Arabian Peninsula. The next morning he will make a private visit to St. Joseph’s Cathedral, the first Catholic church in the U.A.E., dating back to the early 1960s. There he will be welcomed by Bishop Hinder O.F.M. Cap., who has been the vicar apostolic for the southern Arabian Peninsula for almost 15 years, and by members of the Catholic community. Afterward, he will go to Zayed Sports City Stadium to celebrate Mass, in English and Latin, for some 135,000 faithful, migrant workers from many countries. It is expected to be the largest gathering of Christian worship ever celebrated in the Arabian Peninsula. Significantly, it will be celebrated by the Argentine pope who is himself the son of migrant workers and who has made the care of migrants one of the priorities of his pontificate. Francis will deliver a homily at the Mass, during which prayers will be said in several of the many languages of the migrants, including Korean, Tagalog, Urdu and Malayalam. After Mass, there will be a brief farewell ceremony before Francis boards the plane for the seven-hour flight back to Rome, during which he will respond to the questions from some of the 67 journalists accompanying him. Since becoming pope, Francis has reached out to Muslims across the world, as he did to the Muslim community in Buenos Aires when he was archbishop there, conscious of the importance of good relations between the followers of all religions. He has already visited several mostly Muslim countries and territories, among them Bosnia-Herzegovina, Bangladesh, Jordan, Palestine and Turkey. His visit to the U.A.E. can be seen in this context, as is his next visit: to Morocco on March 30. Since becoming pope, Francis has reached out to Muslims across the world, as he did to the Muslim community in Buenos Aires when he was archbishop there. He drew the ambassadors’ attention to the fact that “in addition to those [conflicts] of a chiefly political and military nature, we should not overlook attempts to foment hostility between Muslims and Christians,” notwithstanding the fact that “in different areas of the Middle East they have long lived together in peace.” On several previous occasions, Pope Francis made clear his determination to foster dialogue and peace between Christians and Muslims and to counteract attempts “to foment hostility” between the followers of these two major world religions. Historic and hopeful. And how wonderful that an encounter 800 years ago continues to bear fruit today. Pope Francis keeps inspiring. This is a very important event and the main thing is to establish economic ties. Thus, the medium business will flourish. For business owners I recommend software https://www.bpmonline.com/crm/marketing-automation that helps automate marketing. Bpm’online marketing automation system can also greatly improve your productivity.